Browse for mirrors by vehicle make and model. 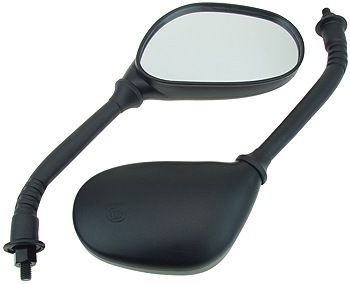 Set of left and right side adjustable wing mirrors for electric scooters, mopeds, and bikes. Threads into brake levers or handlebar mounting clamps with 8mm right hand threads. Set of left and right side adjustable round mirrors for electric scooters, mopeds, and bikes. Threads into brake levers or handlebar mounting clamps with 8mm right hand threads. 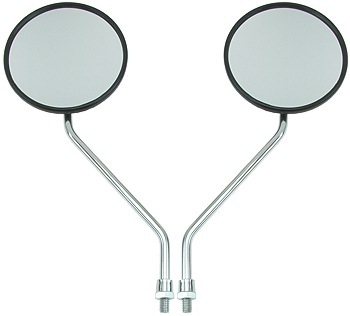 Set of left and right side adjustable round mirrors for electric scooters, mopeds, and bikes. 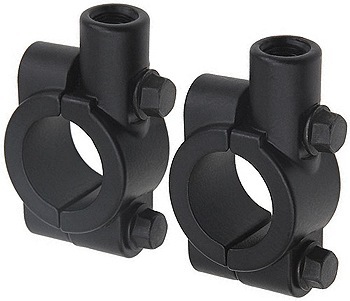 Threads into brake levers or handlebar mounting clamps with 10mm right hand threads. Natural polished aluminum finish mirror clamp set with 8mm right hand threads. Fits standard 22mm (7/8") electric scooter, moped, and bike handlebars. Flat black powder coat enamel finish mirror clamp set with 8mm right hand threads. Fits standard 22mm (7/8") electric scooter, moped, and bike handlebars. 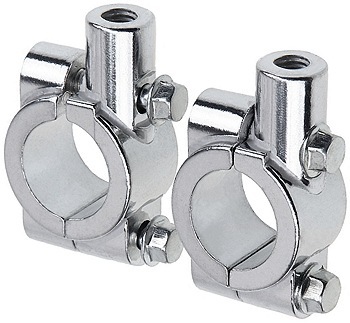 Natural polished aluminum finish mirror clamp set with 10mm right hand threads. Fits standard 22mm (7/8") electric scooter, moped, and bike handlebars. Flat black powder coat enamel finish mirror clamp set with 10mm right hand threads. Fits standard 22mm (7/8") electric scooter, moped, and bike handlebars. 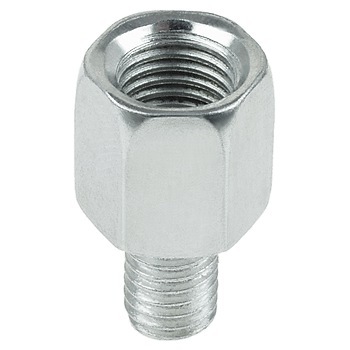 Nickel plated steel 10mm right hand thread to 6mm right hand thread adapter. Allows mirrors with 8mm threads to work with brake levers and mirror clamps with 6mm threads. 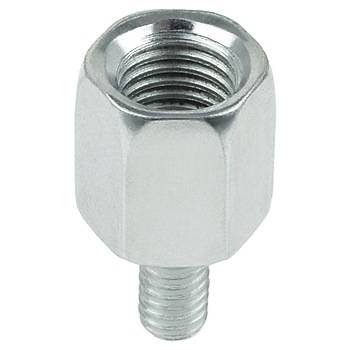 Nickel plated steel 10mm right hand thread to 8mm right hand thread adapter. Allows mirrors with 10mm threads to work with brake levers and mirror clamps with 8mm threads. 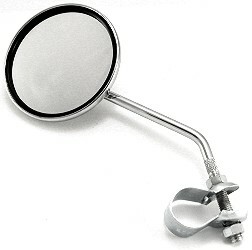 Left or right side handlebar mount classic style round mirror. Fits all electric scooter and bicycle models. Chrome plated steel, glass, and rubber construction. Built-in safety reflector on back side of mirror. 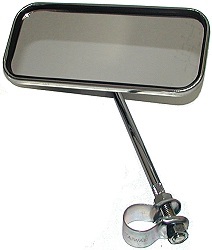 Left or right side handlebar mount wide-view rectangular mirror. Fits all electric scooter and bicycle models. Chrome plated steel, glass, and rubber construction. Built-in safety reflector on back side of mirror.